Celebrate Crown in the Land of the Midnight Demi Sun! Come ye, daring fighters and brave travelers, north to June Crown under the Summer Solstice sun! Do all honor to our King and Queen, Hauoc and Alice, and join us for Their Crown Tourney in the temperate northlands of the West Kingdom. Are you ready for your journey? NOW is the time to book flights to join us for an unforgettable June Crown! Fly to Anchorage International (Ted Stevens) Airport. Now is also the right time to book rental cars and lodging space. It is NOT too early! A barracks pavilion and tents are available. The price is $100 per person for the weekend. This price includes a pillow, sleeping bag, sleeping pad, cot, and a towel. Availability is limited and space will be reserved on a first come, first served basis. 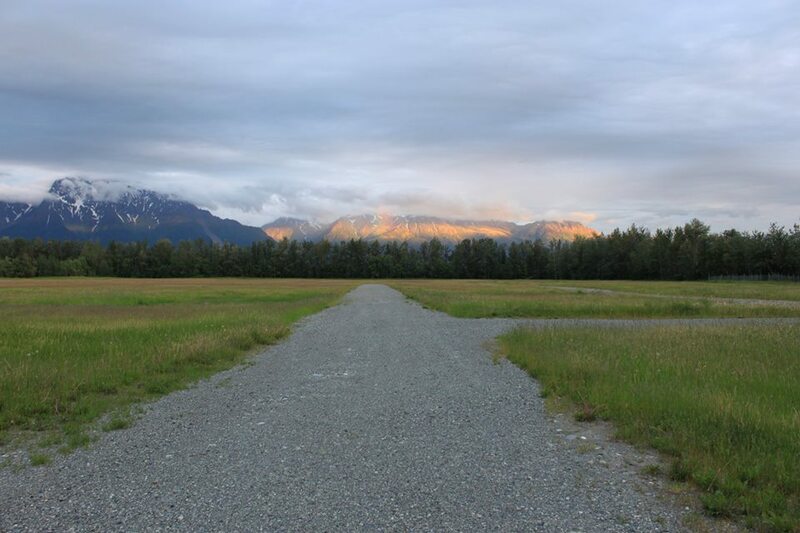 There are B&B’s and hotels available in Palmer, Wasilla, or Anchorage (all an easy drive from the site). A short list of nearby Air BnBs, VRBO rentals, and hotels is available here. If you are planning to bring a pavilion of period appearance and wish to camp along the list field, please email junecrown2019oertha@gmail.com before June 1 with the dimensions (with ropes) and if you wish to be grouped with a specific camp. If you do not wish to camp along the list field, but do wish to reserve a large block of space for your group or household, please include the approximate dimensions of space you require and any preferences you may have as to location (e.g. close to the exit, close to the privies, etc.) in your email. Help us help you have a great time at Crown in Oertha. Take a moment to fill out the June Crown Information Form and let the Event Steward team know if you have transportation or housing needs or if you’re bringing an RV or camper to site. Please click here for the form. Activities planned for the weekend include the Crown Tournament, rapier, archery, classes, Trivia Night, celebrations, and more. Stay tuned to the event Facebook page for the most up to date details. What are the dates? June 21-23, 2019. It will be Summer Solstice weekend! This means you’ll be here on the longest days of the year – the sun will set for roughly five hours in this part of the state, and it won’t get fully dark at night. We’ll do “torchlight” tourneys that won’t need torches. It’s truly something great to experience! Where is the site? The Alaska State Fairgrounds, in Palmer, Alaska. This is about a 45-minute drive from Anchorage. The site is large and flat, and discretely wet. How to get there? The closest airport is Anchorage International (Ted Stevens) Airport. Start looking for airfare this fall! Several airlines fly to Alaska only during the summer, but the best deals are booked far in advance. You can use tricks like the Alaska Airlines companion fare if you have an Alaska Air VISA card, or use air mile bookings. Book early, though, because summer is the prime tourist season and prices go up as the summer season approaches. Book early if you want to rent a car or an RV, too! The event site is RV-friendly, though there aren’t electric hookups. We will be helping coordinate some shuttles from the airport to the site, though, so a rental car may not be required for just the weekend. What should you bring? A smile and a sense of adventure! If you have portable camping gear, bring it. If you have your own favorite backpacking sleeping bag, for example, it wouldn’t hurt to bring it. Also, bring some money! For food, some of our local groups are likely to host fundraiser meals. There are also restaurants and grocery stores not that far from the site. Local merchants will be set up to sell SCA wares, too. If you’re a merchant from outside Alaska, please contact the Event Steward team. We’d love to have you, and have information to share with you. Bring layers of garb. Summers in this area average about 65-75 degrees Fahrenheit in the daytime and cool off to the 50s at night. And the site can be a bit cool when the winds come down off the glacier but that breeze also keeps the mosquitos at bay! Plan accordingly! What will it cost? Adult gate fee will be the Kingdom standard member discount registration fee of $20, and youths under 17 free, no family cap.